Standard & Poor’s has downgraded Ukraine’s long-term foreign currency sovereign credit rating to CC, a notch lower than the previous CCC- level. A default on Ukraine’s foreign-currency debt is a "a virtual certainty," according to the agency. 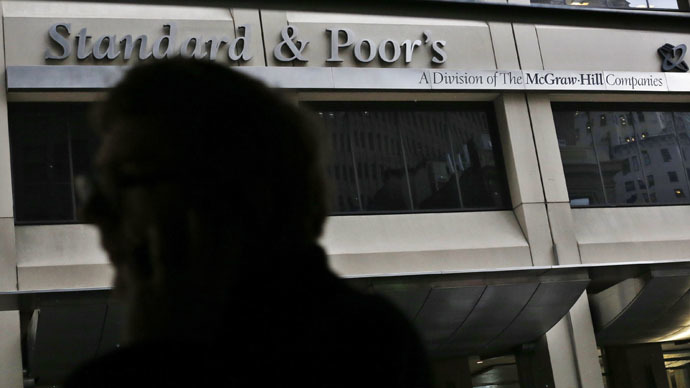 The ratings agency has said that the outlook remains negative. Ukraine's foreign currency rating is the world's second worst, behind Argentina which has a rating of 'SD'. It is still ahead of Venezuela, which S&P has assigned a 'CCC' rating. “The negative outlook reflects the deteriorating macroeconomic environment and growing pressure on the financial sector, as well as our view that default on Ukraine’s foreign currency debt is virtually inevitable," the ratings agency said in a statement. Ukraine’s total debt is estimated at $50 billion, and it has to service about $10 billion of that debt this year, including corporate and sovereign loans and bonds. It will receive about $40 billion in IMF loans in the next four years, as well as separate loan guarantees from the US, Europe, and other allies. Public sector debt rose to 71 percent of Ukraine’s gross domestic product, and is due to rise to 94 percent of GDP in 2015, according to the National Bank of Ukraine. Paying back debt is becoming more difficult for Ukraine as the national currency, the hryvnia, continues to plummet in value. It was the worst performing currency in 2014, and lost more than 34 percent on February 5, when the Central bank said it could no longer support the beleaguered currency. On February 5 the currency hit a historic low of 24.5 per 1 USD, and at the time of publication has only recovered slightly, to 23.4 versus the US dollar. Officially, foreign currency reserves stood at $5.6 billion at the end of March, compared to the $36 billion level in 2011. Ukraine’s economy shrank 6.8 percent in 2014 and is expected to contract another 5.5 percent, according to the IMF’s latest forecast. The lack of foreign currency reserves, the loss of Crimea in 2014, and the ongoing frozen conflict in the south-east are all pinching the already cash-strapped country. Ukraine is currently trying to convince foreign bondholders - from the Russian government to American hedge funds - to agree to a $15.3 billion debt restructuring plan, which, in short, would mean debt forgiveness.